This tutorial will take you through the steps of loading your georectified map from Mapwarper (see this tutorial) into Neatline, as well as how to add items to your Neatline exhibit. The section of this tutorial on loading your georectified map into Neatline is taken from Kristen Mape’s Neatline for Historical Maps tutorial. Check out Neatline’s community documentation list and their sample Neatline exhibits. Go to the Neatline plugin page. Download the plugin to your desktop. It should be a zipped file. Click upload (top menu bar), and then either drag and drop the file from your desktop or select the file for uploading. Once the upload has completed, click the link at the bottom of the page to return to the previous screen. You’ll see a zip file for your plugin in the plugins folder. Click extract (top menu bar) to extract the plugin. Log into Omeka install and click on the Neatline tab (left hand side navigation menu). Then click create an exhibit. Enter in the title and remaining metadata. Select the default spatial layer that you want to be the background of your historical map and its surroundings. Check the public box if you want your map to be visible to site visitors. Don’t forget to save your exhibit. Select the title of the exhibit you just made. You will be redirected to the exhibit editor. Click new record and then style. Scroll down until you reach the imagery section. You will need to know the number of your georectified map as well as the exact title of the map as it appears in Mapwarper. Go to your map in mapwarper.net, click my maps, and select your map. Click the title of your georectified map. 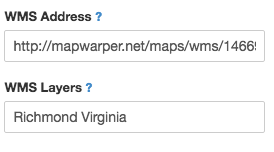 Paste or type in your WMS URL into the WMS address field (mine, for example, is http://mapwarper.net/maps/wms/14669/). 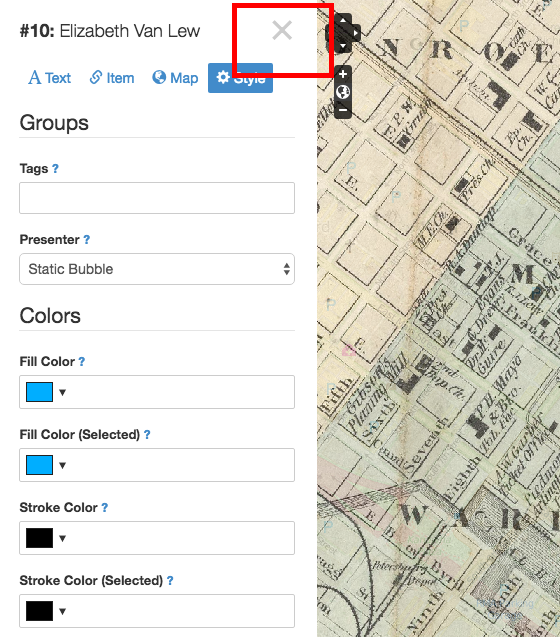 Enter the title of your historical map exactly as it appears in Map Warper into the WMS layers field. Recenter and zoom the map if you wish. Click use current viewport as default, and then click save. Your georectified map will display onto the basemap and the basemap will be zoomed and centered according to your preferences. Your historical map might be very light, so go to the opacity section (in the style tab) and increase the values to your liking. I used 0.85 for fill opacity, fill opacity (selected), and stroke opacity. Click save after making any changes. You will also want to navigate to the text tab and add a title to your georectified map. Don’t forget to click save. Add a slug and title for your item, and add text to the body if you wish. The title can be the same as the item you want to add to your map – I’m going to add the Omeka item Shockoe Hill Cemetery, and within Neatline it will be titled Shockoe Hill Cemetery, and I’m going to use the slug shockoe. Click the item tab, and use the dropdown menu to search for the Omeka item you wish to add to your map. Click the map tab. Navigate to the place on your map where that item is located. Since I’m adding Shockoe Hill Cemetery, I’m going to navigate to the place on the map where Shockoe is located. Click draw point, and add a point to the location. Click the style tab. Zoom and center the map as you wish, and then click use current viewport as default. When you are done adding that item, click save. A light blue dialog box will appear in the upper right hand corner saying the record was saved successfully. Once the dialog box appears, make sure to click the X in the upper right hand corner to close out of the editor. From the Neatline tab of your Omeka install, click on the title of your Neatline exhibit. The map of your exhibit will appear, most likely centered somewhere in Africa. Zoom and recenter the map to where you would it to land automatically upon opening up your Neatline exhibit. Click styles, and then click use current viewport as default. The default map focus and default map zoom will populate automatically based on where you zoomed and recentered the map. Don’t forget to click save when done. If you’re going to be adding multiple georectified maps to this particular Neatline exhibit, you may or may not want to change the default view.